A class of power boats known as Trawlers is catching the eyes and hearts of many boating enthusiasts. 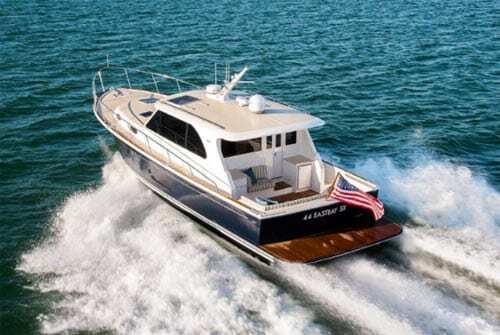 In this article, we will discuss what is a Trawler pleasure boat as well as why so many seasoned yacht owners are buying these sweet crafts. We will end with a look at some of the most popular cruising trawlers on the Central Coast. Traditionally, trawlers were known as a working man’s boat. They had deep hulls for icing down/storing fish and got their name from what they did… drag a trawl net to catch fish. (AKA trawling). Many of today’s pleasure trawlers have full displacement hulls with weighted keels while some have moved to a semi-displacement hull type. Full displacement designs are known to move through the water, rather than on top of it, and are considered very seaworthy and rather slow. Semi-displacement hulls also ride low in the water yet are able to plane versus push through the water. The common theme of the trawler is its look. They have a heft to them, ride deep in the water and often have hoists for a tender. 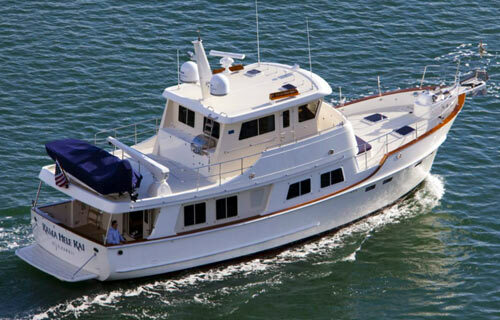 What makes a trawler a popular choice for many boating enthusiasts? Range to reach remote anchorages. Lots of living room and accommodations. Good to great fuel economy. Room to serve as a live-aboard vessel. 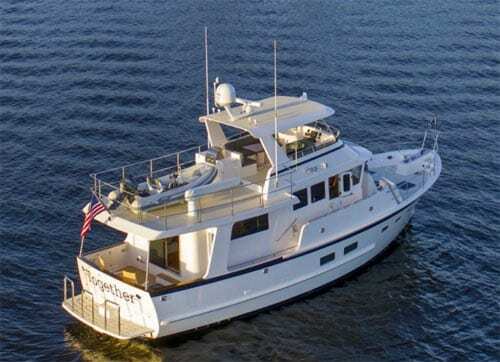 We’ve found that many trawler owners are seasoned powerboat owners who love the idea of long-distance cruising with comfort. Many boats have larger than normal staterooms and under-decks living area. It is not uncommon to find full-size refrigerators or washer and dryers. 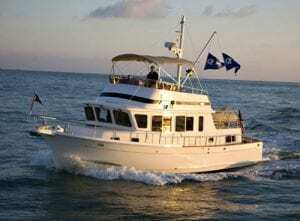 Let’s read what a couple trawler owners say about their boats. 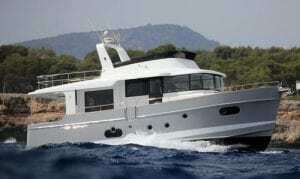 What a trawler isn’t is a fast powerboat, especially those with full-displacement hulls. They are designed for cruising, often at 8-10 knots. 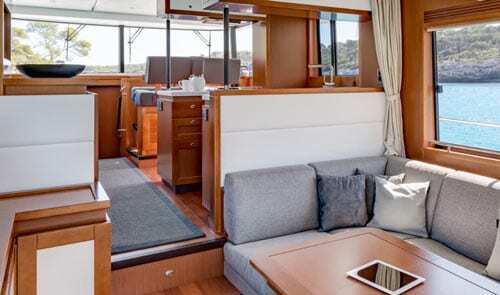 Some of the semi-displacement hulls like Beneteau’s Swift Trawlers double that speed or more. That said, most trawlers are more tortoise than hare as they travel from port to port. What are some of the more popular trawlers on the Central Coast? There are more than 25 manufactures of trawlers. Some, like Nordhavn, stick to the classic style while others are utilizing new building practices to get the needed space from a semi-displacement hull with twin powerplants. This shift has created quite a stir from traditionalists who feel a real trawler has a full displacement hull, and typically one engine. Since 1956, Grand Banks has been building yachts. They are credited with introducing cruising Trawlers to the yacht world back in the early 1960’s with the introduction of the Chantyman and are best known for the ever popular GB42. Grand Banks trawlers, built in Singapore, have changed over the years offering semi-displacement hull options and fine workmanship. One tell-tale of a Grand Banks is the use of exterior teak. While this adds cosmetic heritage to the boats, it also comes with brightwork maintenance. Kenny Keidling, the owner of The Chandlery Yacht Sales in Santa Barbara, has a soft spot for these classic boats. Perhaps it is the fact Grand Banks is a legacy builder with 60+ years in the business and The Chandlery recently celebrated 70 years of service on the Central Coast. Legacy companies are a rare and wonderful thing. Beneteau has a strong following for both their sail and powerboat lines. The Swift Trawler blends the engineering of both to create what boat owners call “wonderful.” Their modern boatbuilding capabilities have allowed Beneteau to create a semi-displacement trawler with both speed (25-knot max) and spaciousness. Like with everything Beneteau does, attention to detail is paramount. This could explain why many seasoned yacht owners choose the Swift. There are so niceties in their design that add comfort to long distance cruising and the live-aboard lifestyle. Kadey Krogen, out of Florida, is another popular trawler manufacturer. The are considered a classic style builder who believes their full displacement hulls are the best in the business. Since they’ve been engineering their patented Pure Displacement Hulls (PHD) for over 40 years they may have a point. Kadey Krogen is known for building a very stable boat with timeless design features. Much of this is obvious when you step aboard one of their richly appointed craft. The salon has a home-like feel often lost aboard many boats. This might explain the cult-like following they enjoy. 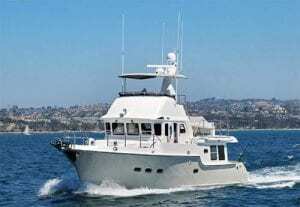 Any list of Trawlers has to include Nordhavn. Nordhavn is based out of Dana Point California and builds their yachts in Taiwan. If you ask a seasoned yachtsman what the name Nordavn signifies, most will say endurance. Their boats are built to cross oceans and have done so for decades. They are also known for being a technically well-engineered craft with design ideas not seen on many of their competitor’s boats. Built by Jet Tern Marine in China, the Selene line of trawlers is vast with offerings in 42’, 45’, 49’, 54’, 60’, 62’ 66’, 78’ and 92’ sizes. Selene’s slogan is Grace and Strength and her name comes from the Greek goddess of the moon. They are known to come with more standard equipment than most of their competitors including bow and stern thrusters. As an all fiberglass boat, maintenance may be a bit easier too. 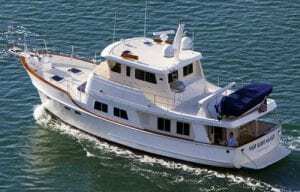 Purchasing a cruising trawler is not for everyone, yet for many, it is a perfect choice. If comfort, storage, and low fuel costs matter more than speed, you just may find them the perfect boat. Naturally, we did not cover all the trawlers available on the new or resale market. It would have made for a very long article. Others such as Nordic Tug, Defever, Tollycraft, Albin and more are found in marinas up and down the west coast. Kenny is quite knowledgeable about trawlers and is here to help you find the perfect fit for your lifestyle and needs. Give him a call 805-965-4538.